US$73,176.82 spent so far out of US$128,458.92 total this year. Most of the OTW’s expenses go towards AO3 upkeep, including the bulk of our server expenses (new purchases and ongoing colocation and maintenance), website performance monitoring tools and systems licenses (access all program expenses). The amount allotted for the original contractor for the Archive of Our Own in the March budget has been reduced due to time constraints. Both the Accessibility, Design & Technology and Systems committees plan to seek new contractors before the end of the year, and next year’s budget will include more accurate forecasts for their work. US$3,360.12 spent so far out of US$5,187.57 total this year. Fanlore expenses are mostly its allocation of server purchase, maintenance and colocation costs, in addition to licenses and domains pertaining to Fanlore directly (access all program expenses). US$2,196.76 spent so far out of US$3,196.76 total this year. Legal’s expenses consist of filing fees and travel expenses for panel presentations (access all program expenses). US$1,736.32 spent so far out of US$2,040.30 total this year. 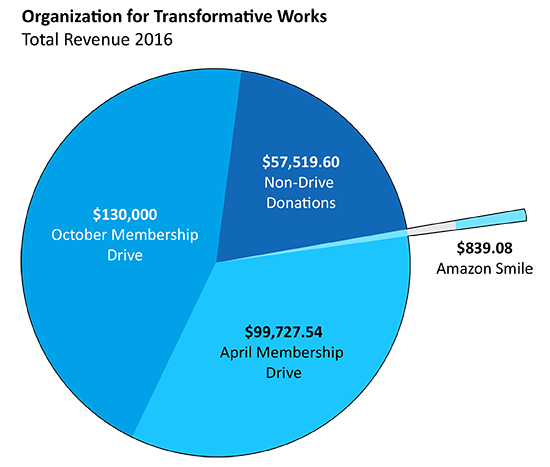 Transformative Works and Cultures’ expenses are its allotment of server costs and fees associated with the journal’s publishing and storage (access all program expenses). US$305.89 spent so far out of US$627.16 total this year. This year’s expenses for Open Doors are hosting, backup and domain costs for imported archives (access all program expenses). US$10,227.54 spent so far out of US$26,737.54 total this year. Our fundraising expenses consist of transaction fees charged by our third-party payment processors for every donation, thank-you gifts purchase and shipping, and the tools used to host the OTW’s membership database and track communications with donors (access all fundraising expenses). US$15,158.96 spent so far out of US$23,254.49 total this year. The OTW’s admin expenses include hosting for our website, trademarks, domains, insurance, project management, communication and accounting tools, as well as contracted services for CPA assessment and tax filing (access all admin expenses). We worked with a CPA to receive an initial assessment of our financial situation and procedures earlier this year, and with an external tax preparer to file our taxes. Having completed both of these, we don’t foresee needing other external financial services until next year. Finance is currently organizing our ledger and processes, and will then reassess the best setup for external services in the following years. We receive most of our donations each year in the April and October fundraising drives, which together should account for 80% of our income in 2016. We’re aiming to raise more than our projected expenses for this year, which should help cover us until next year’s April drive (including a new server! ), plus increase our reserves by about US$30,000. The Finance team is currently looking into the best possible low-risk investment options for the OTW’s reserves; our 2017 budget post will provide more details regarding our reserve policy, such as how many operating months we can sustain with zero donations and under what circumstances committees are allowed to request reserve funds for spending. US$137,886.22 so far and US$150,200 projected until the end of the year. This post will be updated with a chatroom link a few hours before the appointed time. Come chat with us, and bring your questions! Update: Here’s the link to our chatroom. To download the OTW’s updated budget for 2016 in spreadsheet format, please follow this link. This was really fascinating to read, thank you for sharing. I hope the organization meets all goals for 2016-17 and beyond, Ao3 has a such a huge impact on the lives of so many.